Yuzawa Town and neighbouring Minamiuonuma City - located around 200km to the north north-west of the Tokyo region in Niigata Prefecture - are together home to around 20 individual ski and snowboard resorts including some of the most popular and well-known resorts in Japan. With easy and quick access by both train and road and a lot of choice in a relatively compact area, the region is one of the more popular destinations for people in the Kanto region in particular. With heavy and consistent snowfalls each winter and the town being the inspiration and setting of the famous Nobel prize-winning novel 'Yukiguni' (Snow Country), Yuzawa can certainly lay claim to being the original Snow Country. 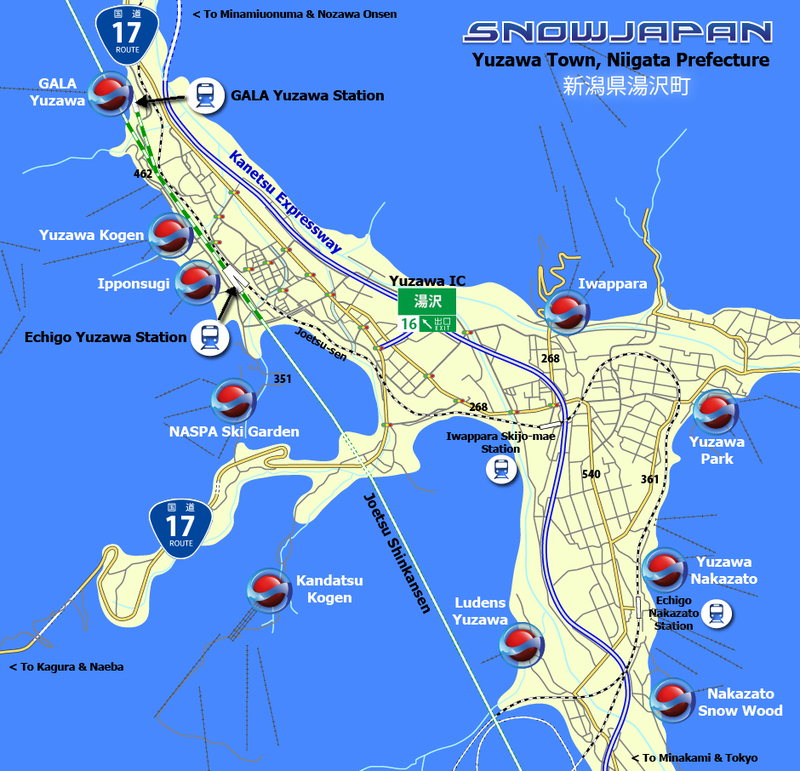 Naeba and Kagura are located a little further out of the main town area than most of the other ski and snowboard resorts, but they are still geographically within Yuzawa town. Naeba has hosted international events in the past and will be hosting the 2016 Alpine Skiing World Cup between 12th-14th February 2016. Also famous for being the venue for the annual Fuji Rock Festival in late July, Naeba is a name that most Japanese people will know. Kagura is famous for a very long season usually stretching from late November until late May - and some excellent powder conditions for much of the peak season. Naeba and Kagura resorts are connected by the 'Dragondola'. Minamiuonuma is the name of the city just to the north of Yuzawa town. Some of the resorts in Minamiuonuma are very close to the centre of Yuzawa making them easy to get to - and they feel like part of the same area. The Joetsu Shinkansen (‘bullet train’) line connects central Tokyo with Niigata City. The train starts from Tokyo Station, stopping also at Ueno Station with many of the trains stopping at Echigo Yuzawa Station on the way to Niigata. The fastest train from Tokyo Station takes people to Yuzawa in just 66 minutes. Two local train lines also go through Yuzawa Town - the Joetsu-sen, connecting Takasaki City in Gunma Prefecture with the Nagaoka City area of Niigata Prefecture) and the Hokuhoku-sen (which actually officially operates from Muikamachi Station, but some trains run straight through from Echigo Yuzawa Station. The Hokuhoku-sen goes to the Naoetsu area of Niigata Prefecture. The main train station in Yuzawa Town is called Echigo Yuzawa Station. Yuzawa Town is unique in that it is actually home to two Shinkansen train stations. The second Shinkansen station is called GALA Yuzawa Station and is less than 2km further on from Echigo Yuzawa Station and actually located in the same building as the gondola that takes you to the slopes of the GALA Yuzawa ski resort.... ultra convenience! More information on that here. Most people visiting from the Tokyo and Kanto region use the quick and convenient Joetsu Shinkansen to get to Yuzawa. The normal charge for the Joetsu Shinkansen journey from Tokyo Station to Echigo Yuzawa Station is just under 6500 yen one way, but various discounts are available with various ski packages and they are worth looking into. Echigo Yuzawa Station is located right in the centre of Yuzawa Town and there are two main exits – the West Exit and the East Exit. The main tourist ‘onsen road’ area of Yuzawa is found just outside and to the right of the West Exit of the station. In mid-winter Echigo Yuzawa station is often very busy and bustling with interesting food stands and omiyage souvenir shops to browse. Taxis are available from both the West Exit and East Exit and many of the major ski and snowboard resorts as well as some of the major hotels in the area also offer shuttle buses and pick-ups from the station – some are free and some for a small charge. If you are staying in Yuzawa it is probably worth asking your accommodation if they will come and pick you up from the station. More resort-specific shuttle bus information can be found below. 一本杉 about 300m No shuttle bus required - this small hill is located just off the main onsen road of Yuzawa, about 300m from the West Exit of Echigo Yuzawa Station. 湯沢高原 about 650m A free shuttle bus is available from the West Exit of Echigo Yuzawa Station. Taxi journey costs around 700 yen. NASPAスキーガーデン about 1.5km A free shuttle bus is available from the West Exit of Echigo Yuzawa Station. Taxi journey costs around 900 yen. 0km from GALA Yuzawa A free shuttle bus from the West Exit of Echigo Yuzawa Station. The GALA Yuzawa resort Gondola to the slopes is located in the same building as GALA Yuzawa Station. Taxi journey costs around 900 yen. 岩原 about 3.5k A shuttle bus is available from the East Exit of Echigo Yuzawa Station. Taxi journey costs around 1,500 yen. 神立高原 about 4km A free shuttle bus is available from the East Exit of Echigo Yuzawa Station. Taxi journey costs around 1,500 yen. 湯沢パーク about 5km A free shuttle bus is available from the East Exit of Echigo Yuzawa Station. Taxi journey costs around 1,900 yen. 石打丸山 about 5.5km A free shuttle bus is available from the East Exit of Echigo Yuzawa Station. Taxi journey costs around 2,000 yen. 0km from Echigo Nakazato Station A free shuttle bus is available from the West Exit of Echigo Yuzawa Station. The local Joetsu line stops at the Echigo Nakazato Station which is located directly at the base of Yuzawa Nakazato ski resort. Taxi journey costs around 2,100 yen. ルーデンス湯沢 about 6.5km No shuttle bus is available. Taxi journey costs around 2,200 yen. 石打花岡 about 7.5km No shuttle bus is available. Taxi journey costs around 2,400 yen. かぐら（みつまた） about 8.2k A shuttle bus is available from the West Exit of Echigo Yuzawa Station. Taxi journey costs around 2,900 yen. Mtグランビュー about 8.5km No shuttle bus is available Taxi journey costs around 2,900 yen. 舞子スノーリゾート about 9km A free shuttle bus is available from the East Exit of Echigo Yuzawa Station. Taxi journey costs around 2,900 yen. 舞子スノーリゾート about 10.5k A free shuttle bus is available from the East Exit of Echigo Yuzawa Station. Taxi journey costs around 3,400 yen. 上越国際 about 12.5km A free shuttle bus is available from the East Exit of Echigo Yuzawa Station. Taxi journey costs around 4,800 yen. シャトー塩沢 about 16km A shuttle bus is available from the East Exit of Echigo Yuzawa Station. Taxi journey costs around 5,000 yen. かぐら（田代） about 17km A shuttle bus is available from the West Exit of Echigo Yuzawa Station. Taxi journey costs around 4,800 yen. (5km from Muikamachi Station) A free shuttle bus is available from Muikamachi Station on the local Joetsu-sen line. Taxi journey costs around 6,500 yen. 苗場 about 24km A shuttle bus is available from the West Exit of Echigo Yuzawa Station. Taxi journey costs around 6,900 yen. (16km from Urasa Station) A shuttle bus is available from the East Exit of Muikamachi Station (Joetsu and Hokuhoku lines) and also from Urasa Station (Joetsu Shinkansen line). Taxi journey costs around 9,800 yen. * The distances shown above are the main routes that are usually taken by shuttle buses - various short cuts exist! >> On the above map click on the resort names, train lines and expressway names for more details. Bus services that run from the Tokyo area through Yuzawa and continuing on to Niigata City are available. The company operating this service is called Niigata Kotsu. The bus uses the Kanetsu Expressway and takes just under 3 hours to get to Yuzawa and costs between 2500 yen and 4100 yen depending on the day and time of day. The first stop in Niigata is at the bus stop on the expressway by the Yuzawa IC. The exit is a few km from the centre of Yuzawa and you'll probably need to get a taxi (or perhaps ask your accommodation to see if they can pick you up). This expressway bus option is cheaper than the Shinkansen train but not as fast, comfortable or convenient. Many travel and tour companies offer day trips from the Tokyo region to various resorts including those in the Yuzawa area by train or bus or a combination of both. Sometimes these offer excellent value for money though they often offer you less time on the slopes. Check out the local train stations and travel companies for information on these offers... if you can speak and read Japanese you might be surprised at how many options there are available! Joetsu-sen from Echigo Yuzawa to Muikamachi. Hokuhoku-sen line from Muikamachi to Tokamachi. Iiyama-sen from Tokamachi to Togari Nozawa Onsen Station. Nozawa Onsen is about 7km from Togari Nozawa Onsen Station. Iiyama line from Tokamachi to Iiyama Station. Hokuhoku-sen line from Muikamachi to Naoetsu. Myoko Haneuma Line from Naoetsu to Myoko Kogen Station. Joetsu Shinkansen from Echigo Yuzawa Station to Takasaki Station. Hokuriku Shinkansen from Takasaki Station to Nagano Station. Nagano (Nagaden) line from Nagano Station to Yudanaka Station. 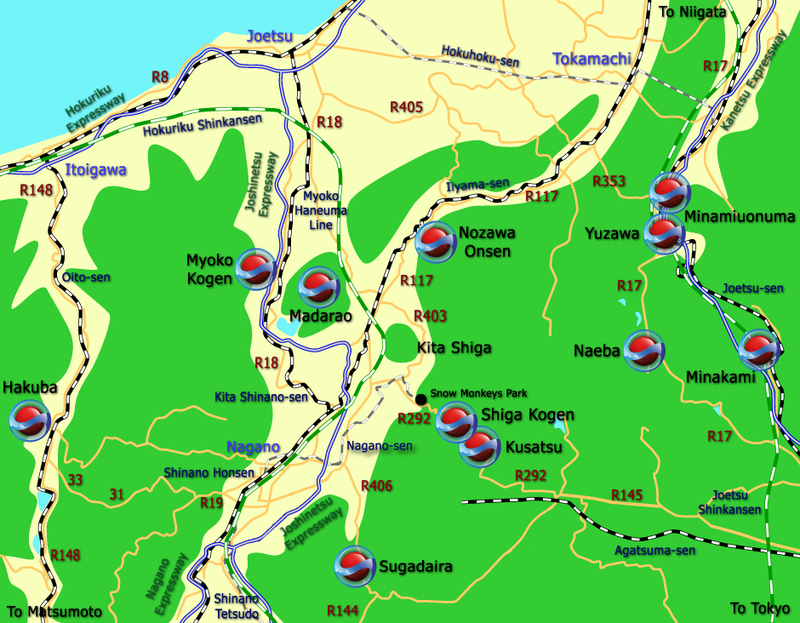 The nearest area of Shiga Kogen (Sun Valley) is about 13km from Yudanaka Station. Joetsu-sen from Echigo Yuzawa Station to Muikamachi Station. Hokuhoku-sen line from Muikamachi Station to Naoetsu Station. Nihonkai Hisui line from Naoetsu Station to Itoigawa Station. Oito-sen from Itoigawa Station to Hakuba Station. For detailed information on how to get to Yuzawa and Minamiuonuma by car, please go to this section.